AzhwAr out of great love towards emperumAn‘s supremacy, explains that with examples. Thus, AzhwAr explains emperumAn‘s supremacy over all, easily approachable nature and his charming nature which increases the sweetness of him. In previous decad, the distress which AzhwAr experienced (in separation from emperumAn) is beyond explanation. When the ocean is burning, is it possible to cool it down by pouring water? He was thinking that he would die in distress. But subsequently, emperumAn manifests in front of him and AzhwAr’s distress completely disappears. On analysing the reason for that (such disappearance of the distress), the bliss of seeing bhagavAn is unlike any material joy. 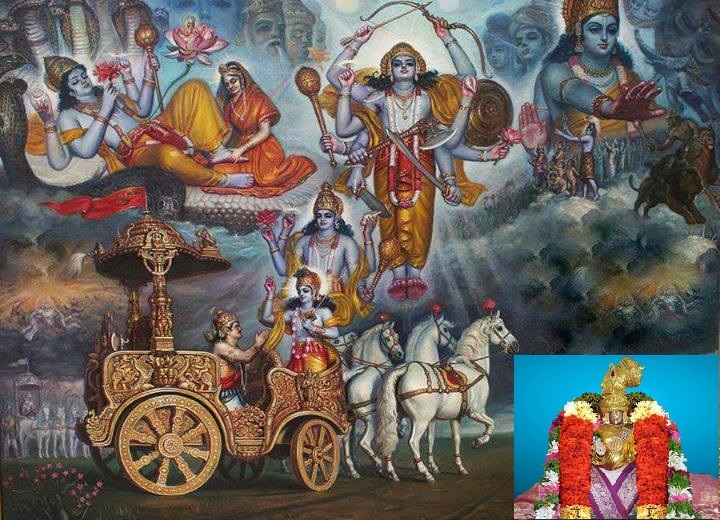 bhagavAn’s greatness is such that, just like one cannot think about anything else in separation, even in union, one cannot think about anything else than him. AzhwAr analyses the reason for such greatness and finds out that emperumAn being filled with all auspicious qualities as the reason. And for that (having all auspicious qualities), him being the supreme lord is the reason. AzhwAr said “uyaravaRa uyarnalamudaiyavan” (filled with auspicious qualities) first and immediately realized “ayarvaRum amarargaLadhipathi” (leader of nithyasUris). So, AzhwAr mercifully explains such supremacy of bhagavAn which he realized. piLLAn says – since previously AzhwAr realized kAraNthvam (being the cause) in thiruvAimozhi 2.1.10 “mUvA muthalvA” (youthful cause of all), here he is further explaining that attribute. A question arises here – “emperumAn‘s supremacy is explained previously by AzhwAr. Why is he repeating it?”. AzhwAr cannot stop speaking about emperumAn (and his qualities). emperumAn too is so great that he cannot be explained just once. And in matters related to bhagavAn, repetition is not a defect. AzhwAr can simply enjoy emperumAn‘s single quality. emperumAn too is capable of giving blissful experience (to AzhwAr) on the same quality again and again and make AzhwAr feel as if he is enjoying a new quality. thirumangai AzhwAr too said in periya thirumozhi 8.1.9 “paNdivaraik kaNdaRivathu evvUril yAm” (where did I see him before?) and nammAzhwAr himself says in thiruvAimozhi 2.5.4 “eppozhuthum nAL thingaL ANdu Uzhi UzhithoRum appozhuthaikku appozhuthu en ArAvamutham” (every day, year, time after time, he feels nectarean every such moment). Previously, in the first decad (of first centum), when AzhwAr explained emperumAn‘s supremacy, it is svAnubhavam (self-experience); here, he experiences emperumAn’s supremacy while trying to explain that to others to establish the principle clearly in others’ minds. There, he explained in affirmative terms; here, he is explaining it in both affirmative and negative terms. There, he explained it following Sruthi (vEdham, upanishath); here he explains it following ithihAsa and purANas. There, his supremacy in parama padham is explained; here, his supremacy in incarnations is explained. This entry was posted in thiruvAimozhi, thiruvAimozhi 2nd centum on January 8, 2016 by Sarathy Thothathri.